Organizing one’s family history research is practically a full time job, isn’t it? I already have a full time job, so I have to get (and stay!) organized to make the most of the tiny windows of time I have available to actually do research. December first I began scanning records related to my non-direct-line ancestors. I decided to only maintain hard copies for my direct lines unless, of course, the document is an original. This reduction in paper worked so well I was able to give away a file cabinet! 06 Dec 1854 – Maria Elizabeth Kauffman was born on this day. She married my 2nd great-granduncle Emile Schmitt in Cincinnati. Both Emile and Maria (or Mary) died in their forties, leaving their teen-aged children (Arthur J. and Alvina M.) orphaned. A second look at Mary reminded me to connect this family on Find A Grave. And that inspired me to add a visit to Spring Grove Cemetery in Cincinnati to my bucket list. 10 Dec 1877 – Maria and Emile Schmitt had a son on this date named Carl Julius who died young. A second look at his file showed a missing date of death. That was a reminder to share one of my favorite web sites with you. It’s the Cincinnati Birth and Death Records 1865-1912 at the University of Cincinnati. 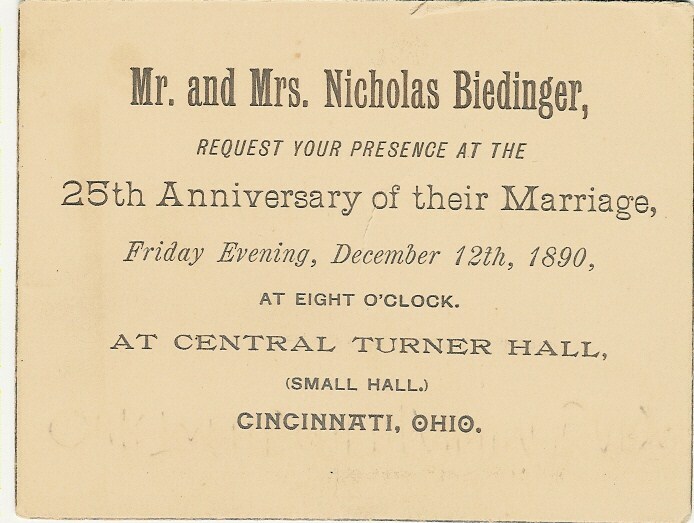 12 Dec 1890 – Emile Schmitt’s sister Sophia and her husband Nicholas Biedinger celebrated their 25th wedding anniversary on this day. A second look at Sophia’s file gave me the opportunity to meet a distant cousin who shared this with me: It was such a pleasure “visiting” with my newest family connection. Many thanks Diane! 15 Dec 1883 – Maria and Emile Schmitt’s daughter Alvina was born on this day. I’m terribly curious about Alvina and her life after her marriage to Otto V. Mueller ended. In 1912 she returned to Ohio where she lived until her death in 1972. From her son-in-law’s obituary I learned she had three granddaughters; Mrs. Jerry W. Storey, Fox Chapel, Ohio; Mrs. Robert R. McFarlan, Minnetonka Minn., and Mrs. Richard A. Allnutt, Covington, and nine great-grandchildren. A second look at this family intensified my desire to connect with a living descendant of Alvina M. Mueller nee Schmitt (15 Dec 1883-12 Oct 1972). 18 Dec 1843 – My 2nd great-grandfather James Walton was born on this day on the Isle of Man. He immigrated with his family to Cleveland Ohio in 1871 when my great-grandfather was just seven months old. A second look at this direct-line ancestor reminded me to celebrate James Walton’s birthday by sponsoring his memorial on Find A Grave. 26 Dec 1846 – On this day, my 3rd great-grandparents Helena Christina Åman and Carl Tolf were married in Sweden; see image below. Their banns were posted on the 1st, the 8th and the 15th of November. The couple immigrated to Batavia Illinois in 1878 with four of their children. (The oldest four children awaited their arrival in the U.S.) A second look at their entries on my tree reminded me that I still don’t know the specifics of their final resting place/s. Let the quest begin anew! 29 Dec 1829 – My 3rd great grandmother Lisa Cathrina Petersdotter was born in Vallsjö, Jönköping, Sweden on this day. She and her husband Johan Peter Landstrom followed their children who had immigrated to Chicago Illinois in the late 19th century. A second look at Catherine’s file made me shake my head. Had I forgotten to look for an obituary after her 15 Sep 1902 death? Looked but failed to find? Found but neglected to copy or transcribe? Ugh. Looks like I could use a refresher of Genealogy 101. 31 Dec 1726 – My 7th great-grandmother Sara Lisa Jacobsdotter was born in Sweden on this day. That was 287 years ago and I have seen digitized images of her birth record thanks to ArkivDigital. This second look at Lisa’s date of birth reminded me that this is a good time to be on the planet. * A photo of Emma’s sister Maria Frederika Petersdötter (my 2nd great-grandmother) appears on the home page of this blog. Happy 2014 to one and all – I wish you the best of luck with your research, and good fortune in all the other areas of your life. Happy New Year!